I couldn't believe my sensory systems when I opened my package from a secret pal from the foodblogoshpere. There it was, an entire panful of homemade Chewy Chocolatey Brownies carefully placed in a box filled with other goodies, express-courriered from the Low Lands. 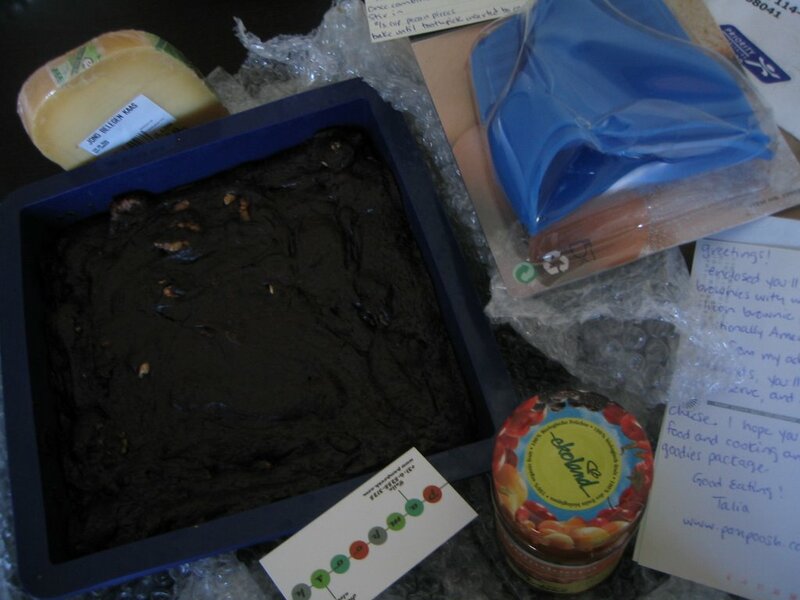 Talia at Pampoosh who blogs from Amsterdam sent me a parcel filled with edible goodies and kitchen gadgets. 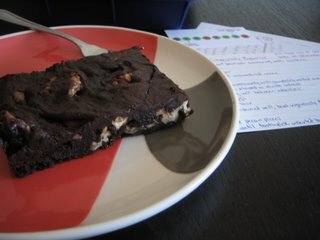 She explained in a handwritten note that she chose the traditional brownie as it represents her homeland the USA. She even took the time to create a recipe card for me so I can recreate the dessert myself. 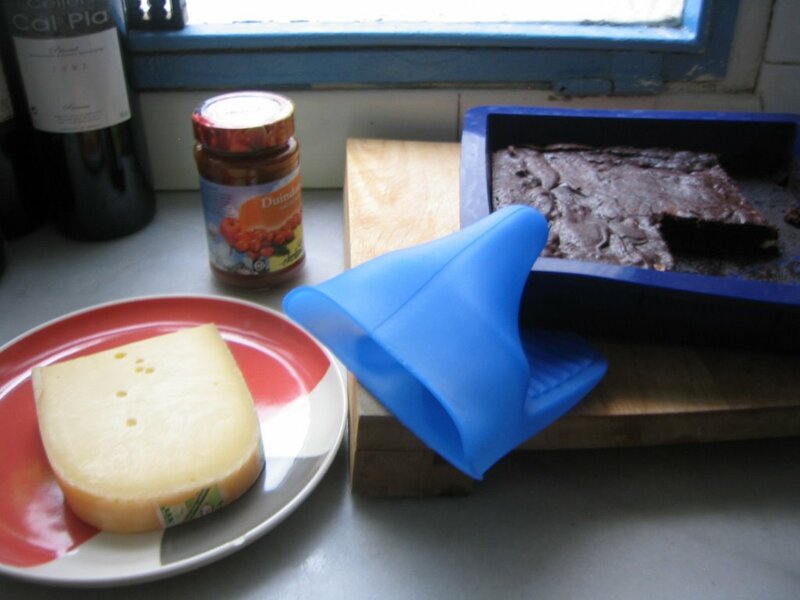 Encasing the chocolate brownie was a ultramarine-colored square silicon cakepan, that I have been vying for. My first exposure to silicon heat-resistant kitchenware was when I received a KitchenAid grabber for Christmas 2005. Adding to my silicon collection are a pair of baby blue magic gloves that Talia chose to complement my new cakepan. Boy was it useful when I tried out the pan last night, filling it with sheets of fresh pasta sheets, ricotta cheese, and a tomato beef sauce. Since the silicon material makes the entire panful of lagsagna wobbly, the magic gloves came in to rescue and assisted me to steadily retrieve the pan out of the oven. Along in the food parcel came some Jong Belegen Kaas (means semi-matured cheese) from Holland's premiere cheese producer, Bastiaansen. The cheese is mild in taste but rich in flavor. It went perfectly well on small toasted slices of country bread. Somehow the flavorful bits reminded me of the kind of Kraft cheddar cheese that my mum used to feed me as afternoon snacks when I was younger. The last item was a jar of jam from a fruit I would venture to say exotic, simply because I am not familiar with it. The marmalade was made out of organically grown berries known as argousier (french), duindoorn (dutch). and buckthorn berries in English (not a clue.) I guess it is pretty common in Europe because Lionel recognized it right away. He knew what it was. Anyways, we tried it out on toast this morning for breakfast and it tasted great! I thought it tasted like cherry tomatoes but that could be due to my being influenced by the picture that bore resemblance to tiny sweet berries/vege displayed on the jar. By now you must be green with envy with all the goodies I've gotten :) Take heart, you might be able to recreate this little activity with a friend who lives in a foreign country. Wouldn't that be a neat idea? To send a surprise food package to each other? Here are some ideas from other food bloggers who participated in the event, to give you a start! Note: Muchisimas gracias a Talia!! Read about the goodie pack Anne in Stockholm received from yours truly in Barcelona. posted by *kel at 6:52 a. m.
Wow! Generous indeed; sounds superb. Glad you had some fun with EBBP hopefully you will be able to join in the next round. Sounds delightful--and I have to get one of those oven mitts, I have been wanting one for a long time, I think you have convinced me! Those brownies looks like they'll just melt in the mouth. Scrumptious.